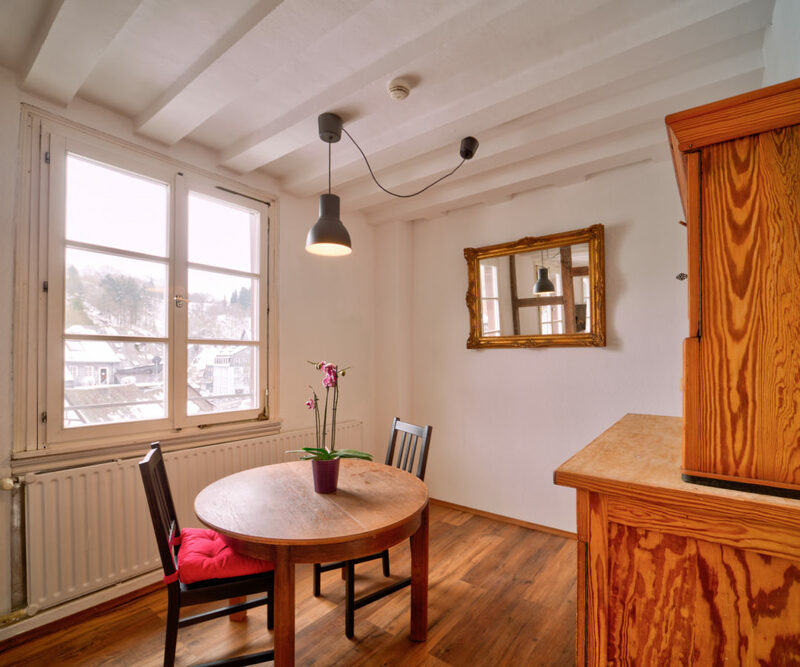 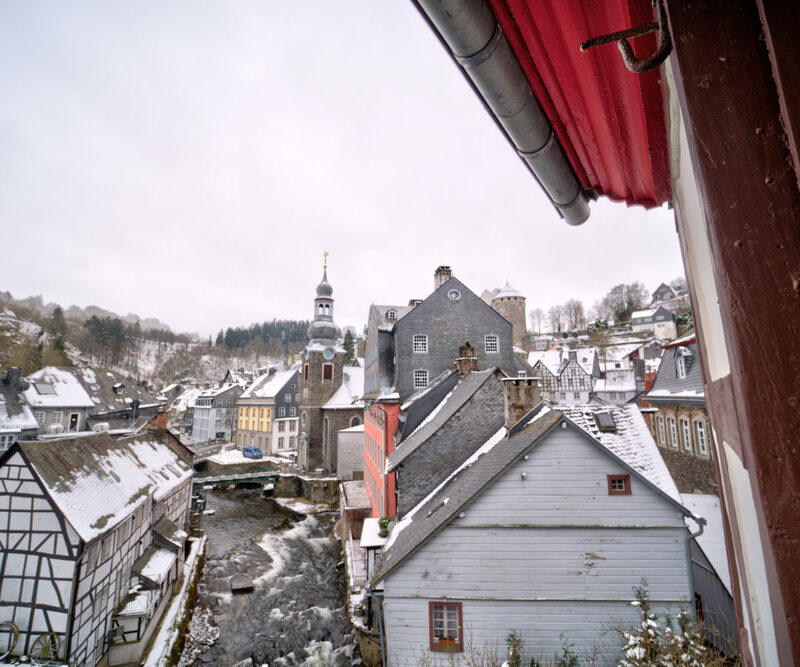 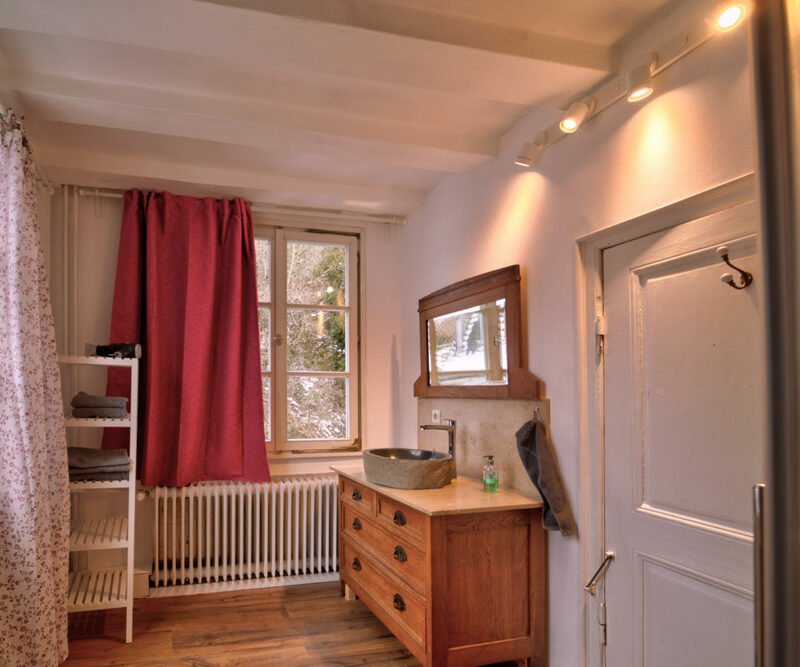 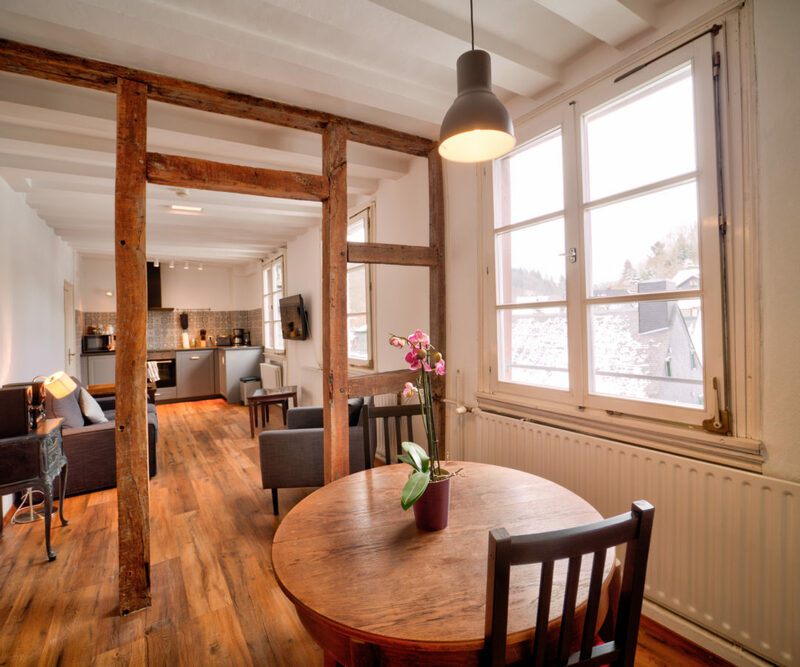 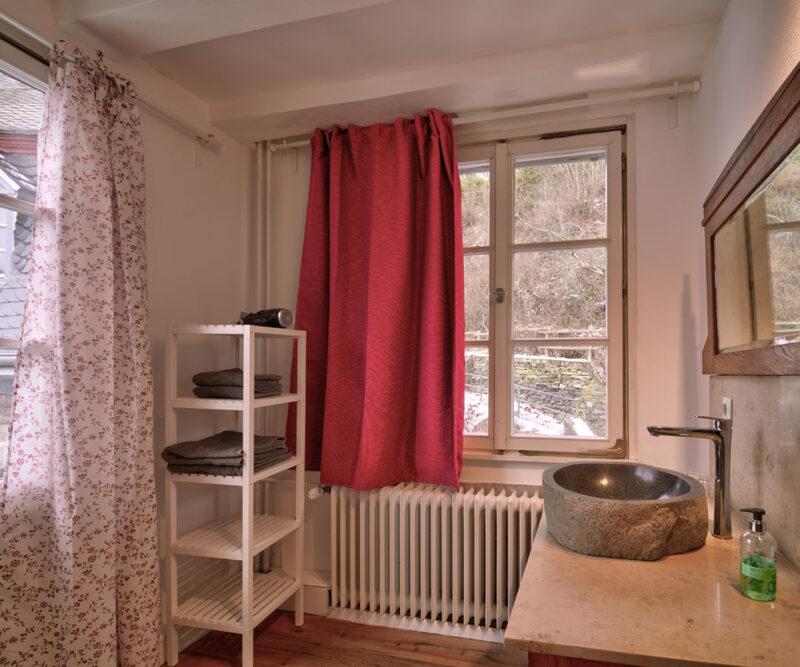 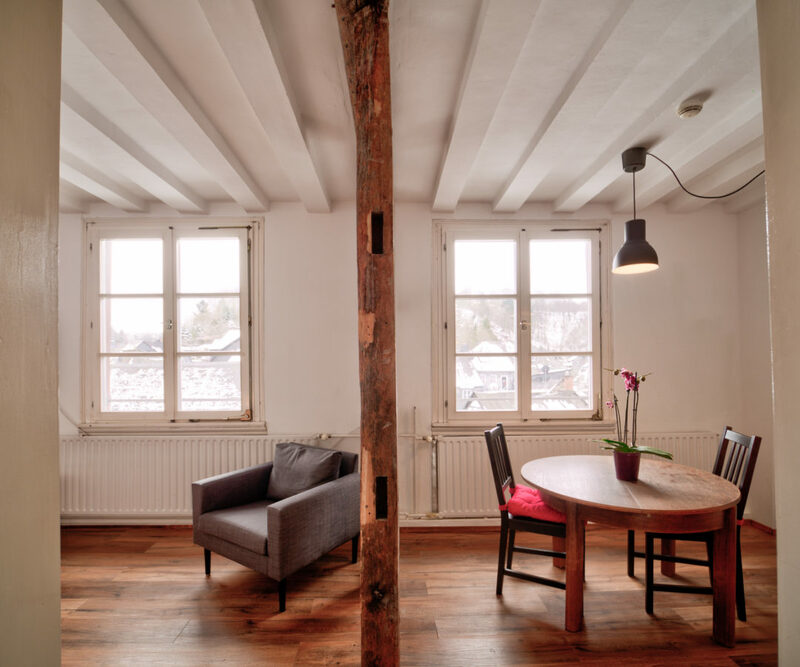 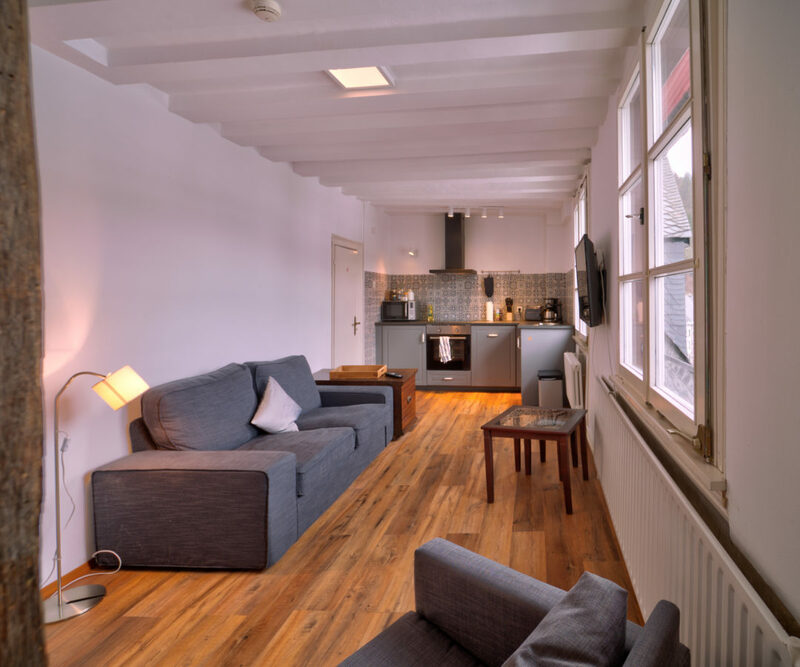 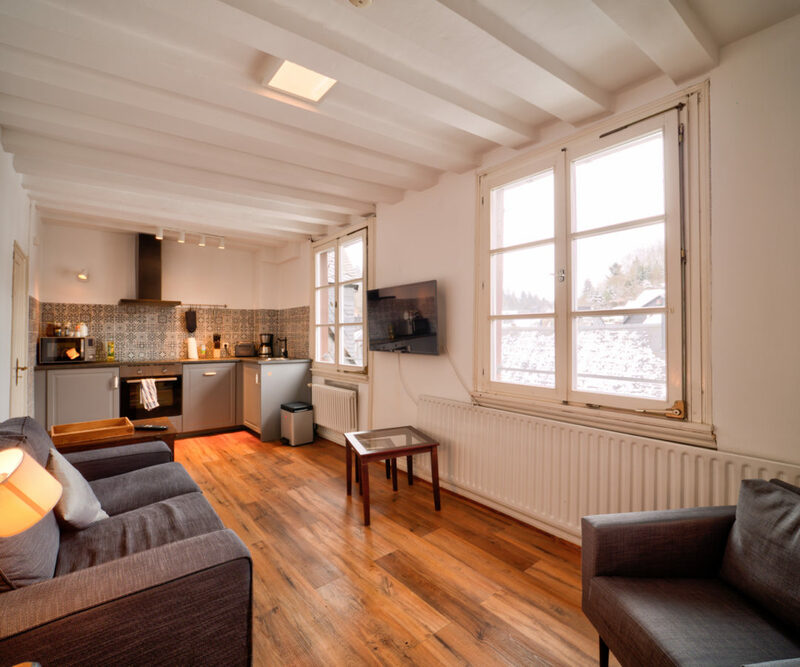 The 55 m² large Monschau-Suite is the hide away for couples in Monschau. 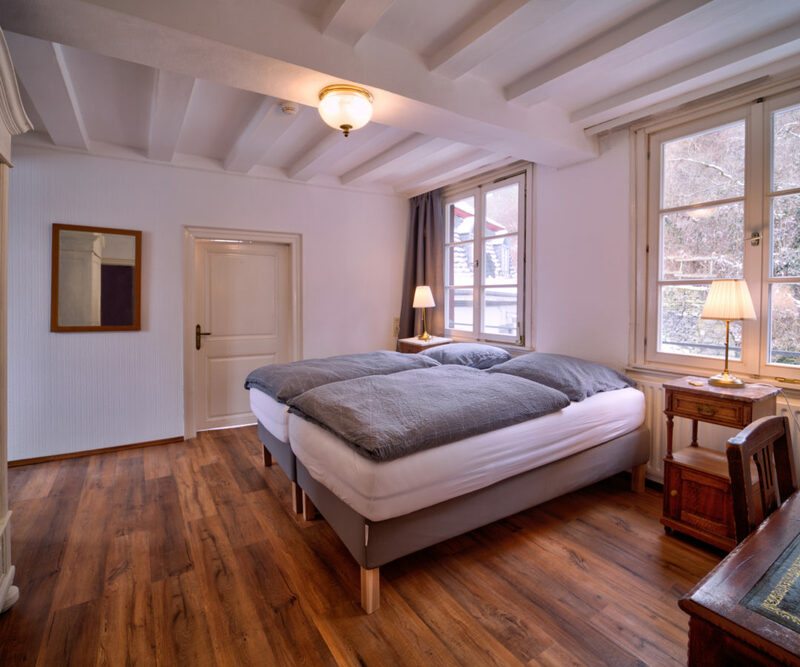 The bedroom with the comfortable box spring double bed offers view on the frame mountain with Haller. 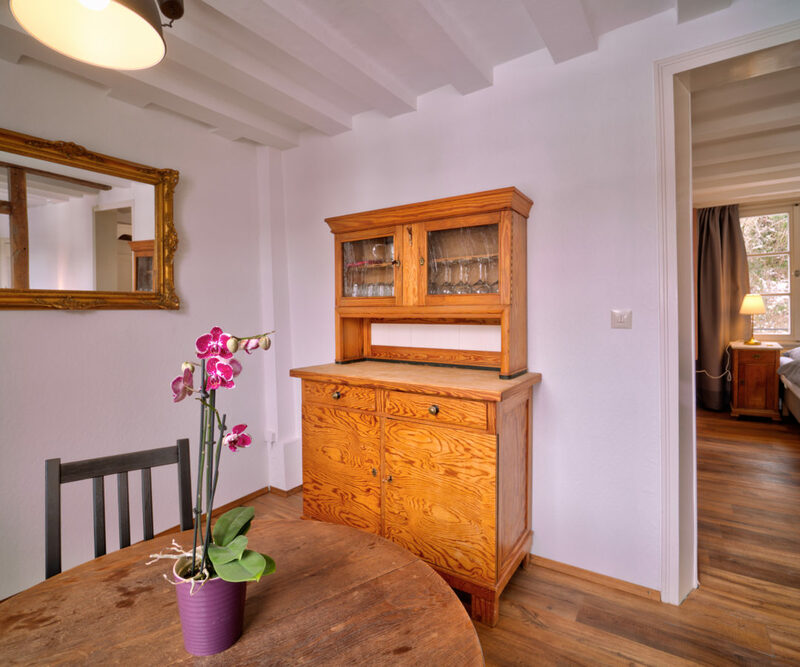 A large wardrobe and a historical desk complete the interior. 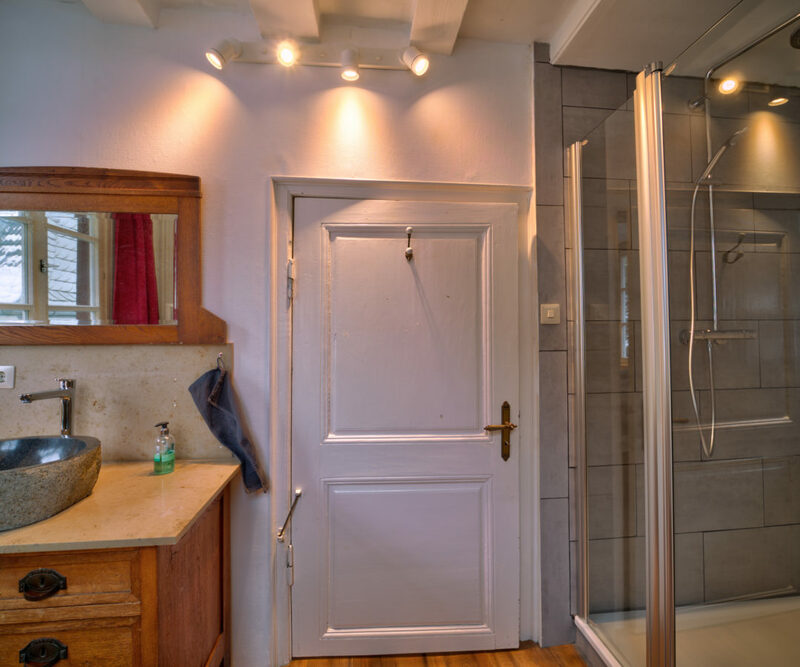 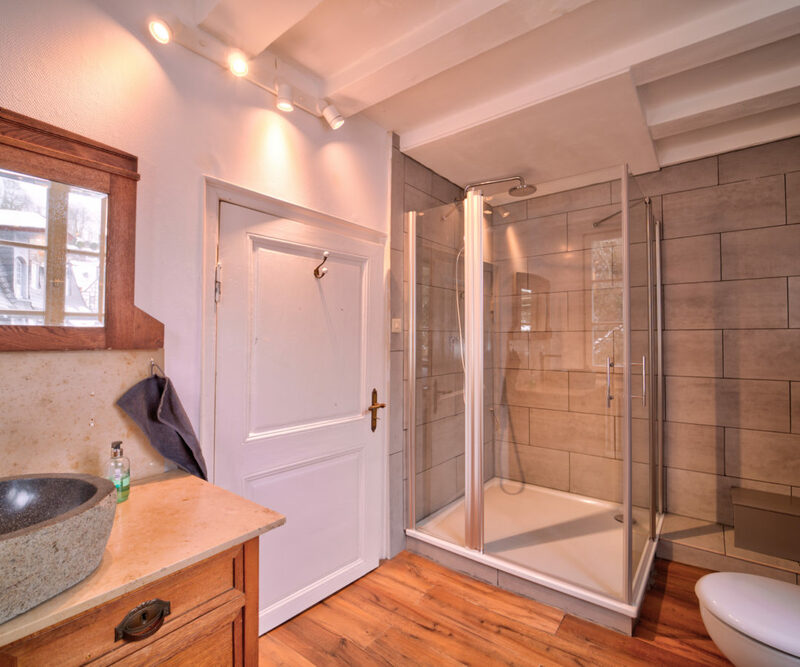 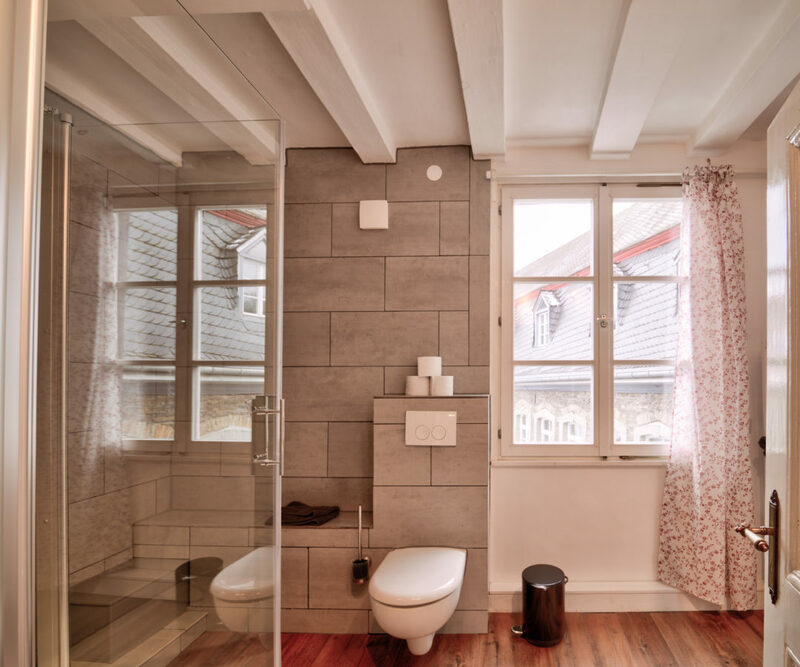 The adjacent spacious Daylight Bathroom shines with a large shower and WC. 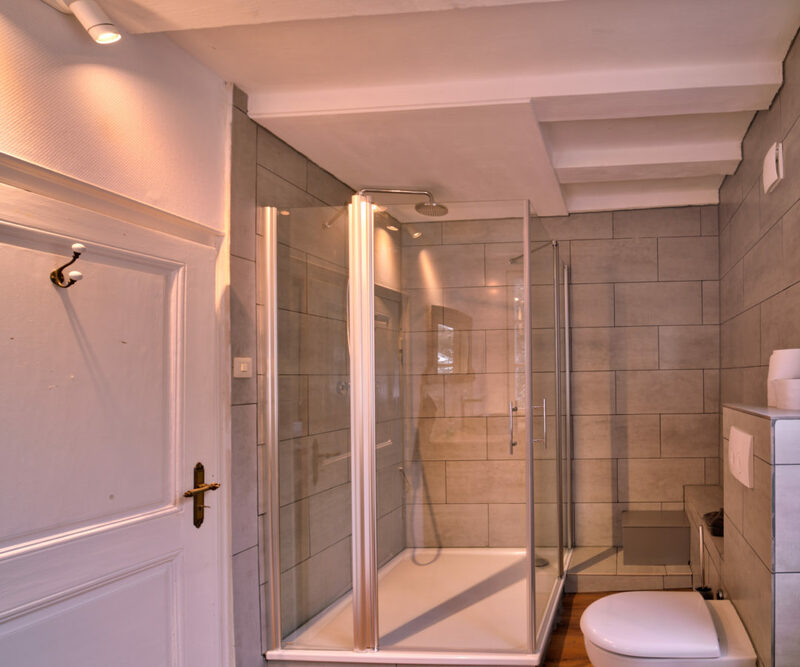 Shampoo/shower gel is available for you in the bathroom. 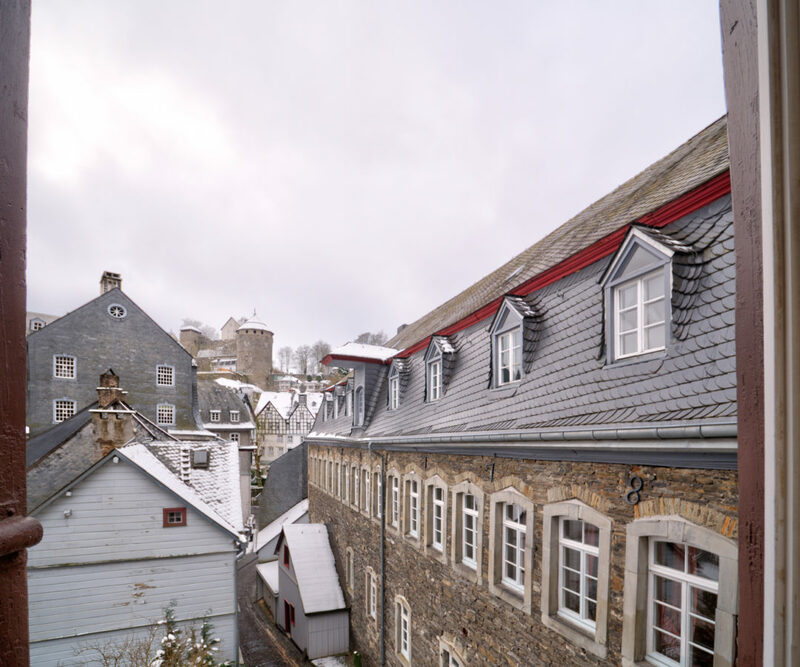 Here you look towards Haller with Rahmenberg or Burg and Rotes Haus. 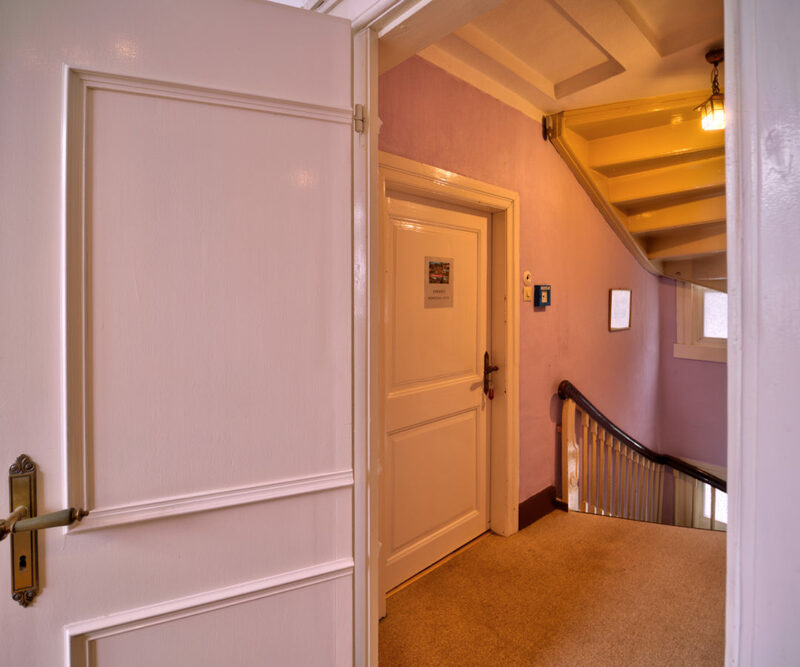 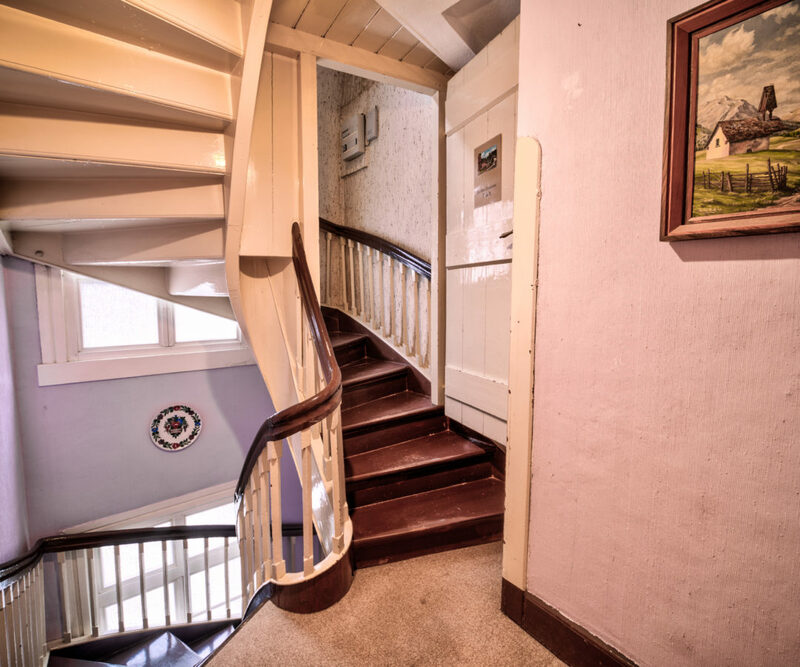 The highlight is the adjoining room to the Rurseite of our Monschau-Suite. 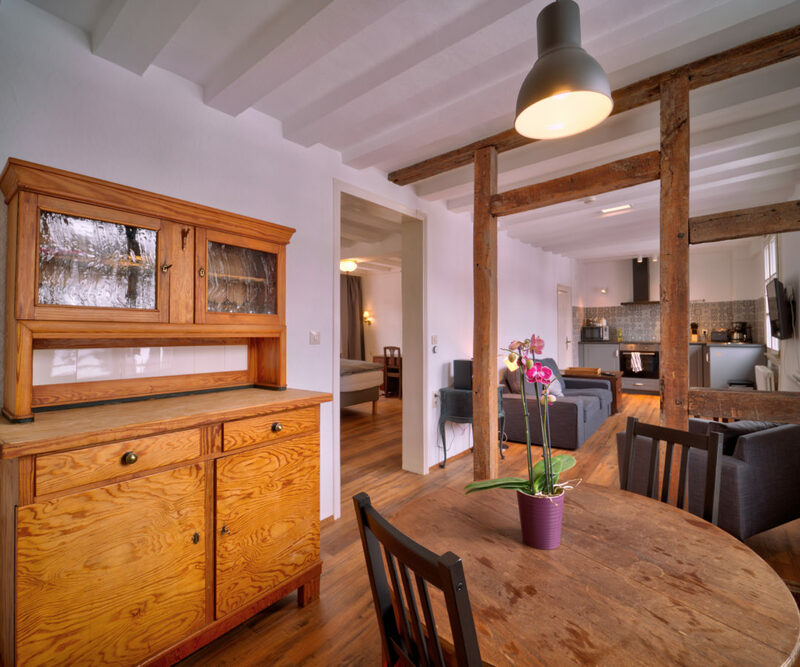 On the right, only delimited by exposed oak beams of the half-timbered house, is the dining area with a buffet cabinet. 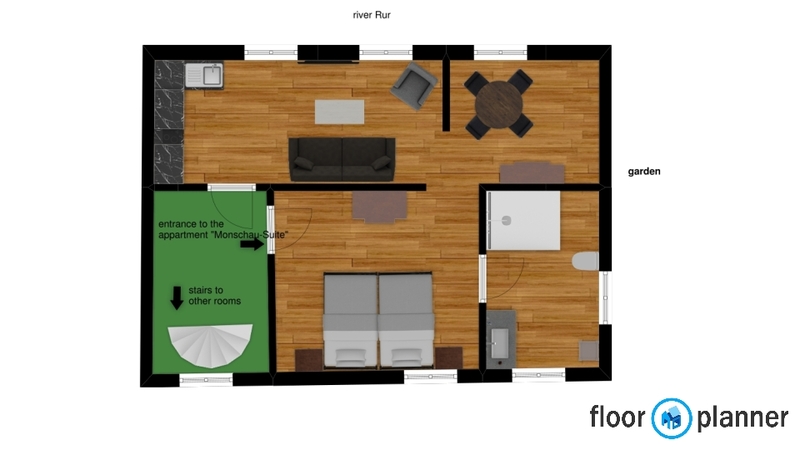 On the left the living area begins with a music system next to the cosy couch. 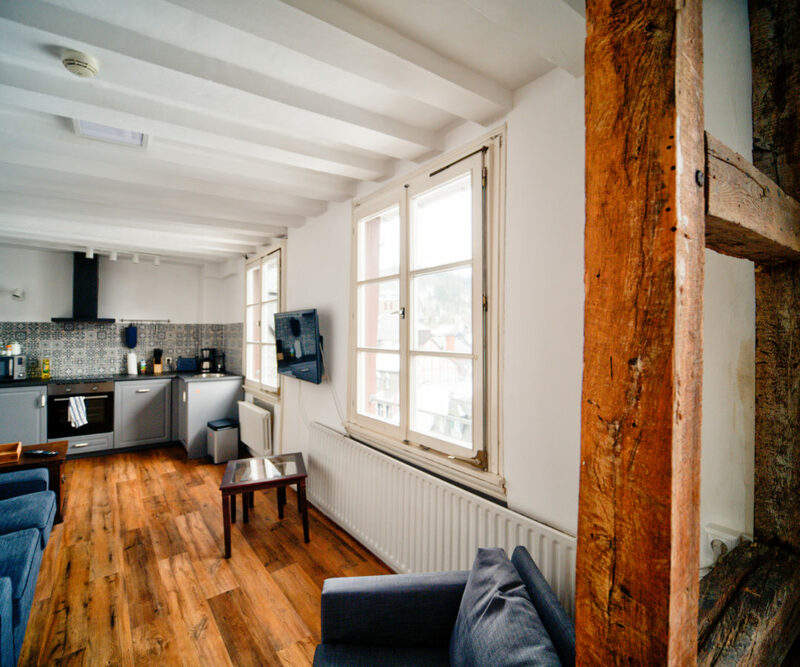 Large windows offer unique views of our old town and the Rur with its historic mill wheel. 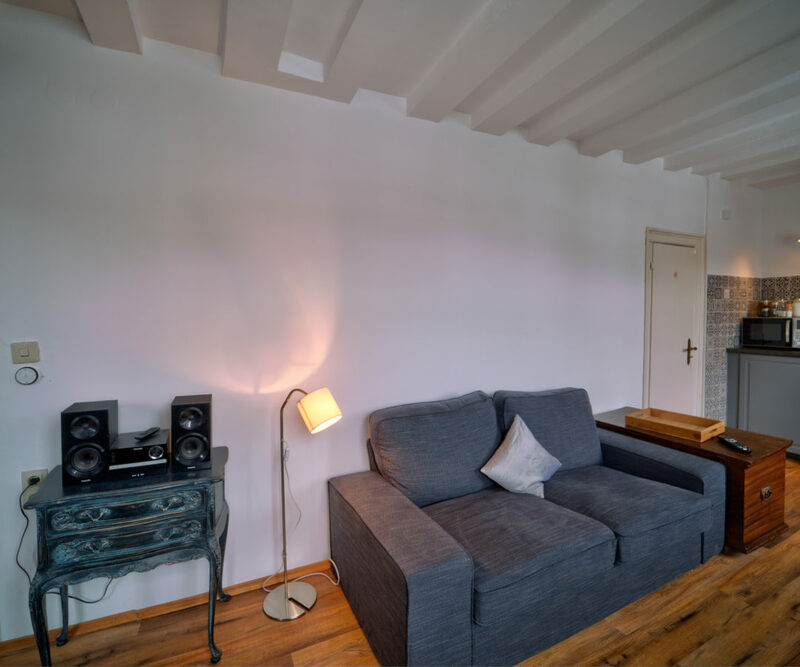 If you’ve had enough, the opposite Smart-TV flat screen offers enough distraction, not least thanks to Netflix subscription. 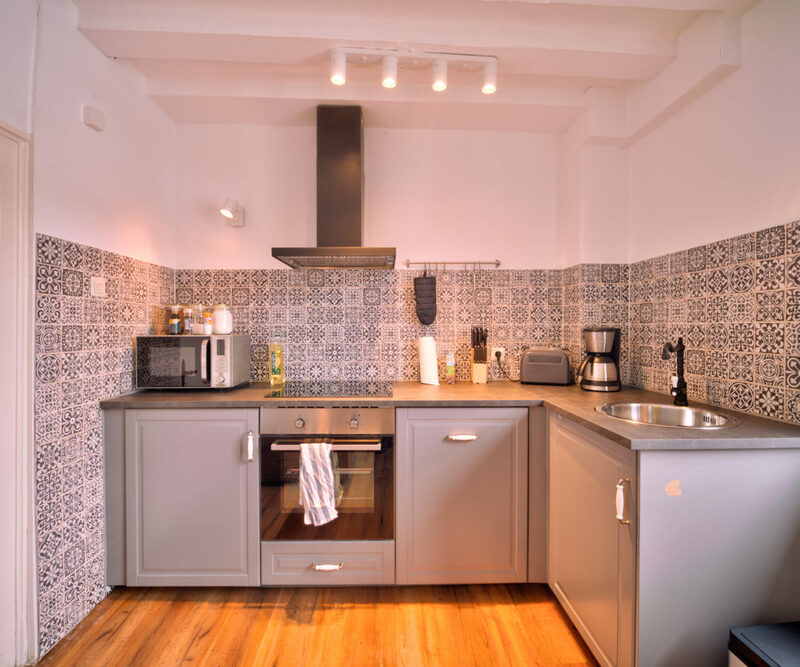 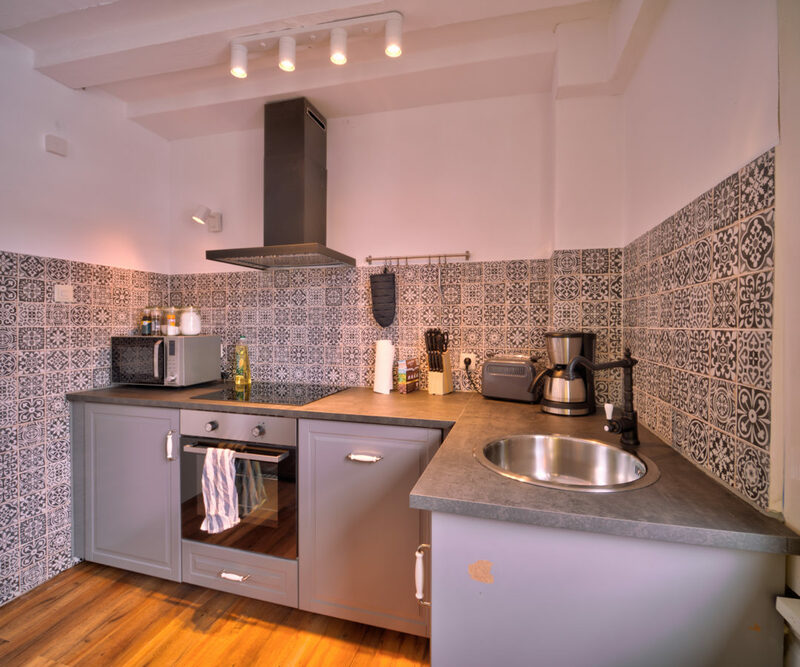 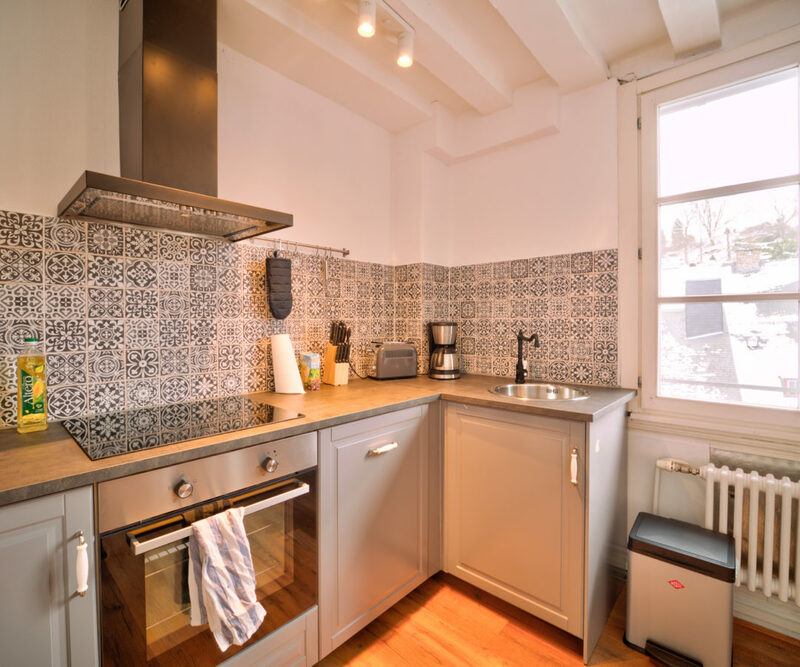 The equipped, modern kitchen offers microwave, oven, stove, refrigerator, toaster, dishwasher and coffee machine, champagne glasses as well as coffee and tea accessories. 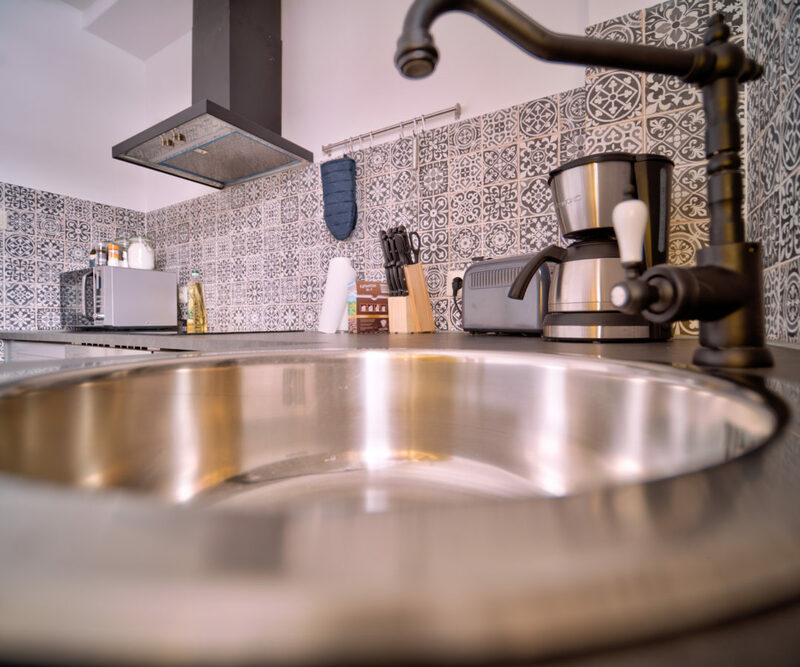 Small things of the daily need, like washing-up liquid, usual spices, vinegar and oil are likewise present. 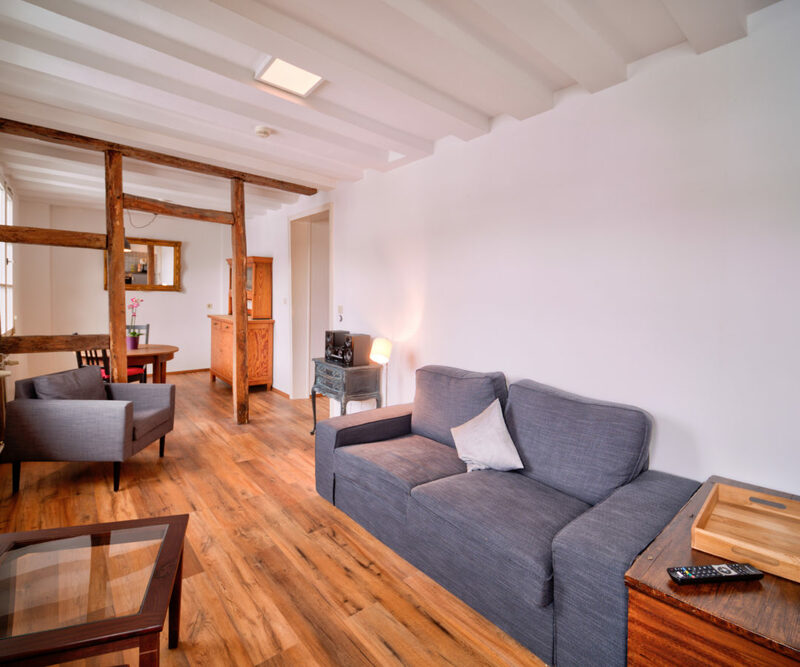 Our rooms are all individually furnished. 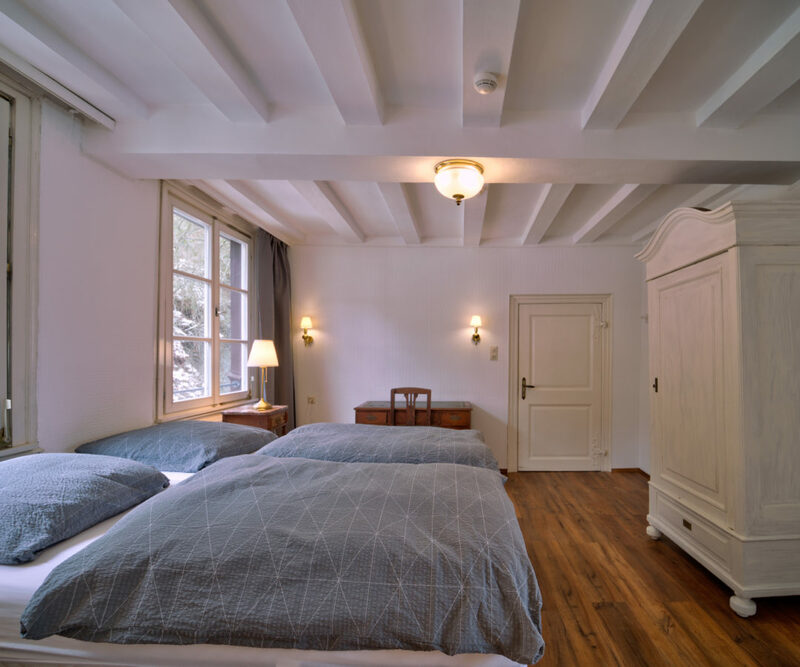 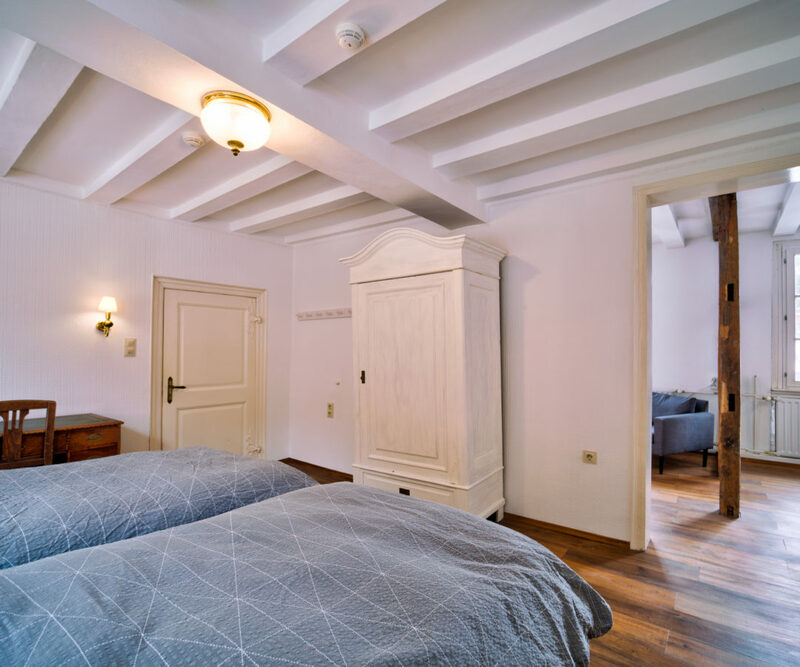 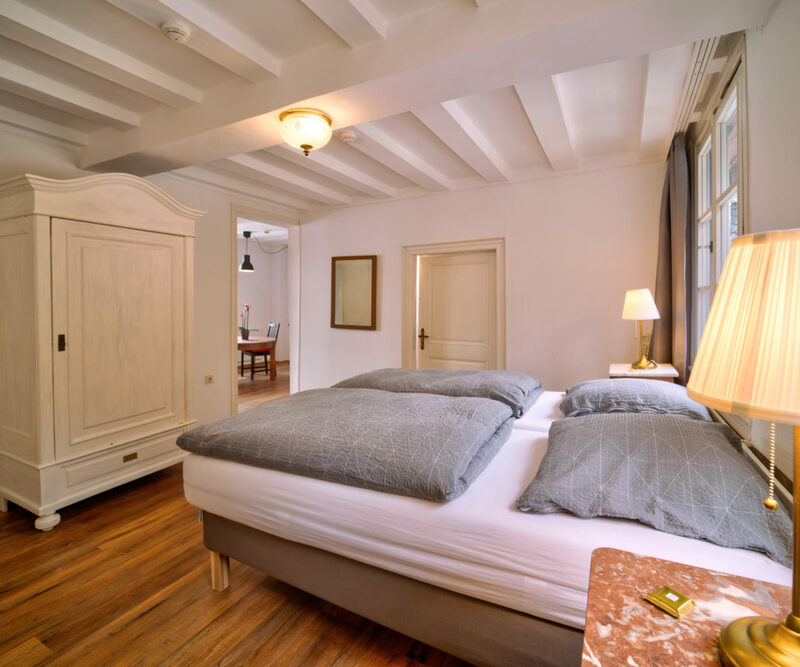 Historical, partly stucco ceilings, partly Cologne ceilings and historical furniture, supplemented by contemporary comfortable box spring beds, create a special atmosphere. 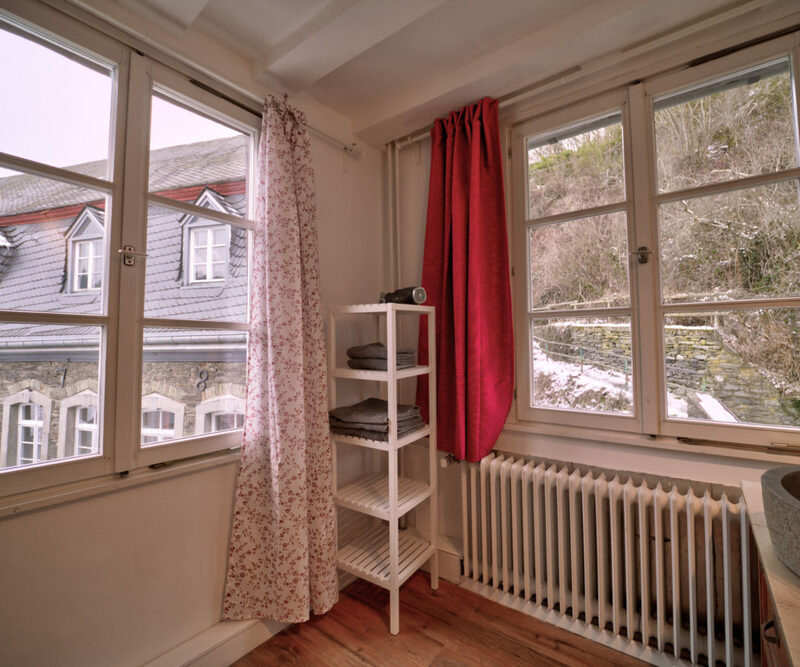 Double glazed windows and a modern heating system will not let you freeze even in winter. 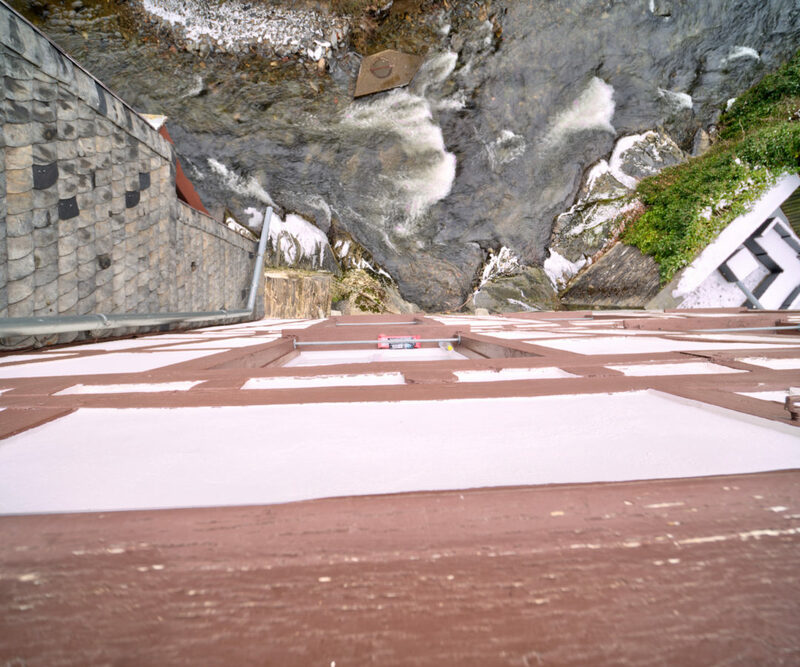 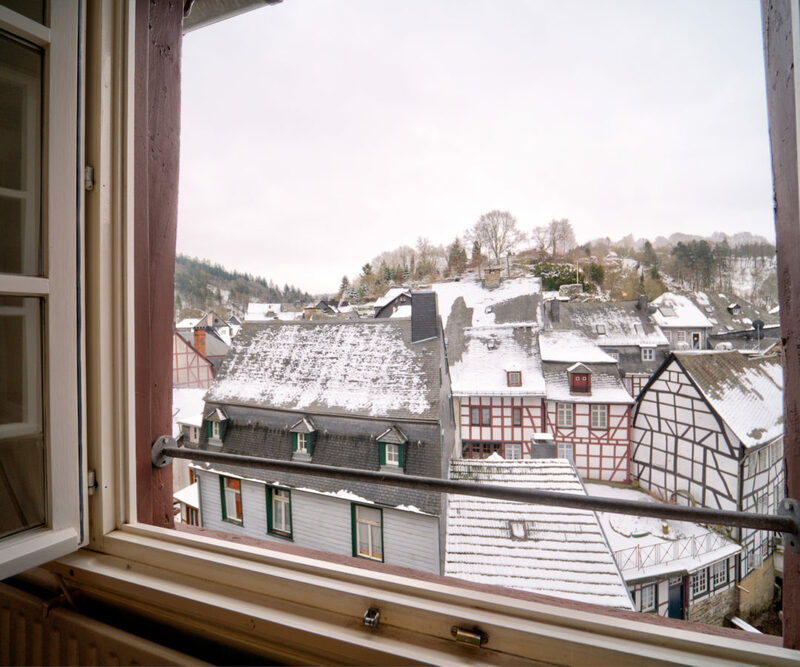 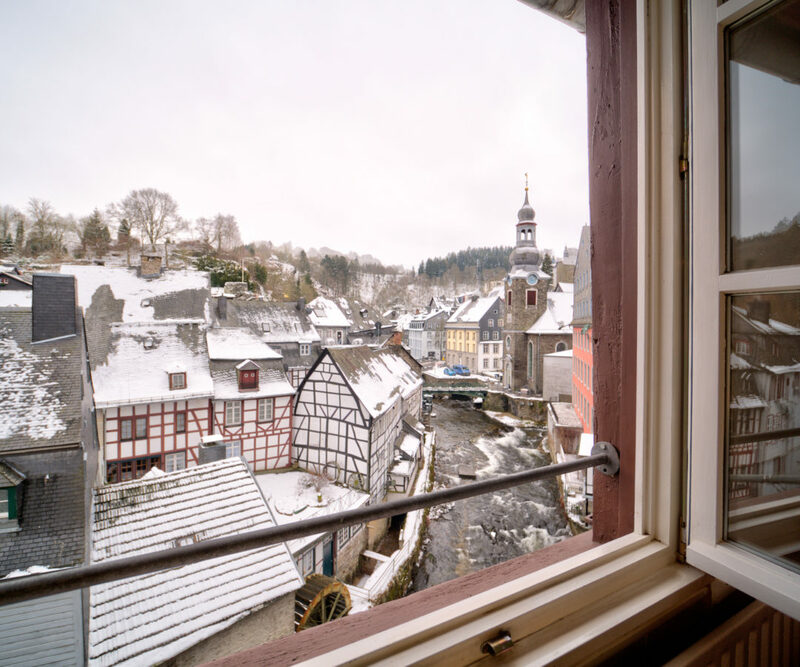 A total of six large windows offer views of the garden, the idyllic old town of Monschau and the Rur.